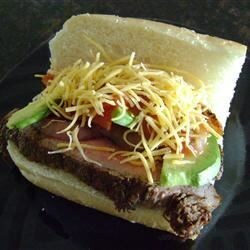 "My carne asada steak sandwich with avocado salad recipe is perfect for tailgating. About ninety percent of this recipe can be prepared in advance - meaning that when game day rolls around, all you'll have to do is fire up the grill, cook the steaks, and melt the cheese on the bread." Stir together cayenne pepper, paprika, black pepper, cumin, onion powder, garlic powder, allspice, thyme, and 1/4 cup olive oil in a large bowl until evenly mixed. Smear the flat iron steaks with this paste, then wrap with plastic wrap, or place into a resealable plastic bag. Marinate in refrigerator for 6 hours. Prepare avocado salad by gently mixing cubed avocado, green onion, red bell pepper, red onion, cilantro, and tomatoes. Drizzle with lime juice and olive oil; season to taste with salt and pepper. Cover and refrigerate until ready to use. Grill flat iron steaks until cooked to desired degree of doneness, or to an internal temperature of 135 degrees F (57 degrees C) for medium-rare, about 4 minutes per side. Remove from grill and allow to rest for 5 to 10 minutes. While the steaks are resting, cut each baguette into three pieces, then halve the pieces horizontally. Toast bread, cut-side down on grill until golden brown. Turn baguettes over, and place sliced cheese on the cut sides; allow cheese to melt. To assemble sandwiches, thinly slice the flat iron steaks across the grain, and pile onto baguettes. Top with avocado salad before serving. Watch Chef John create the juiciest, meatiest steak sandwich ever. This was so good, the avocado salad cools down the spicy meat. I marinated the meat overnight. We sliced thinly after grilling and used for fajitas. Will definitely make this again! Excellent!!! I never worked with flat iron steak before. This recipe was easy and delicious. Followed the recipe exactly...wouldn't change a thing! Followed exactly and we loved it! Amazing. However, I feel that you definitly need to scrape some of the rub off before you grill. It was super spicy. A new week nite dinner for the fam.